Can their luxury sedan take the fight to the establishment this time round? VW has built an enviable reputation for itself in the compact hatchback segment. Its crossovers too are well up to giving the competition a hard time, but when it comes to their more luxurious offerings things haven’t always been quite so easy. Who can forget the VW Phaeton, or perhaps remember it? With most VW models fitting in price-wise below the Audi models, it is always a tough sell when a VW model starts to encroach into that established luxury sedan territory. 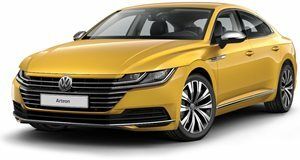 The Arteon is VW’s latest attempt at moving the brand upmarket and the German carmaker has just announced pricing for the 2019 model. This is VW's halo model and as such has a lot riding on its sleek coupe-styled shoulders. The base model starts at $35,845 MSRP and this gets you a 268 horsepower turbocharged inline-four mated to an eight-speed automatic transmission; the optional 4Motion AWD system adds another $1,900 to the price. Standard features are comprehensive even for the base model and you get 18-inch wheels, LED headlights, adaptive damping and VW’s impressive 6-year/72,000 mile bumper-to-bumper warranty. An R-Line package will be available on all models adding sporty design elements and either 19-inch ($1,265) or 20-inch alloy wheels ($1,765). In keeping with the Arteon’s range-topping status, it can also be optioned with a full complement of driver assistance technologies like lane, light and park assists as well as the cool Volkswagen Digital Cockpit and Nappa leather covered seats. The Arteon will be available in three trim levels, namely SE, SEL and SEL Premium with the latter starting at $44,945. That is rather close to Audi’s own A5 Sportback which is actually $745 less expensive in base form. It may be slightly less powerful (248 hp as opposed to 268 hp) and less well-equipped but the allure of the premium badge may make the higher-spec Arteon a hard sell, and it does admittedly have a more upmarket looking interior even in base trim. It is at the lower trim levels that this stylish new addition to the VW stable starts making a lot more sense. It shares its basic underpinnings with those more expensive Audi models, and you don’t need to stretch any further than the mid-range $39,995 SEL trim. Equipped as standard with the Digital Cockpit, adaptive cruise control, leather seats and adaptive headlights, this may well turn out to be the sweet spot in the Arteon range. Expect to see the Arteon at US dealers in April.